A great success, to finally end slavery, but still face hardships. Former slaves were still treated horribly and the discrimination continued on for decades. The Grandfather Clause, Jim Crow, the “separate-but-equal” ruling in the Supreme Court all treated African Americans inhumanly. Thankfully there were civil rights movement, MLK and Rosa Park, Malcolm X as leaders helped us, but there is still abuse such as police brutality and…modern slavery. The sad reality is that slavery still exists, as I had pointed out in my other publication, Whitney Benns states in her article American Slavery Reinvented, “large prisons throughout the region that they quickly filled, primarily with black men” and is showing the division that still occurring. Racism, the huge quantity of black men being incarceration, businesses gaining billions from the cheap labor. Examples of the labor the prisoners had to do were said in Carimah Townes article “‘It’s just dressed up slavery’: America’s shadow workforce rises up against prison labor” stating “the grunt work that most people have to do behind bars: scrubbing floors, cooking, sewing clothes, manufacturing license plates for the general public.” The prisoners are put under very bad working conditions, basically sweat shops. Yet no one is doing anything because some believe that criminals “deserve it” or it is a way to have some type of revenge/ give back to the community. 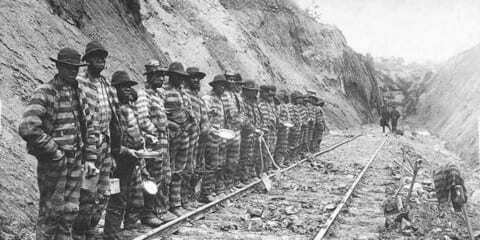 Prisoners should have rights even, the 13th amendment is out dated when it says, “except as a punishment for crime whereof the party shall have been duly convicted.” Prisoners, though they have made mistakes should have some sort of punishment but to be treated like slaves, or punish them if they disobey is not humane. To be put in solitary confinement, from human contact, that is a cruel punishment. “According to the Marshall Project, federal work programs pay up to $1.15 an hour while wages at state prisons average 20 cents an hour” CNN’s article Why US inmates launched a nationwide strike, states. Not only are the prisoners put under bad working conditions but cheap labor, this is how businesses thrive. Businesses pay such low wages so that it isn’t seen as slavery. Their “loophole.” How is it that we even know if these prisoners are guilty? How do we know what punishments to give? “The Prison Industry in the United States: Big Business or a New Form of Slavery?” an article in Global Research claims, “Sixteen percent of the country’s 2 million prisoners suffer from mental illness.” People are put in prisons, some having mental disabilities and should be getting help. Instead because society does not know how to deal with them and discriminate like they do with black men and people of color, that they are shoved into prisons. Such a major issue, what should be done? First there should be more press coverage, a way to inform people to get them to be active in their communities and push for equality of these prisoners. With more involvement, people will protest more, since protesting did not really work in prisons. There has to be some way for people to demand change, form regulations or change the constitution. People must see what the problem is, to see that it is truly a problem and want a change because if not we will continue this cycle of discrimination and injustice. Benns, Whitney. “American Slavery, Reinvented.” The Atlantic. Atlantic Media Company, 21 Sept. 2015. Web. 30 May 2017. Blau, Max, and Emanuella Grinberg. “Why US Inmates Launched a Nationwide Strike.” CNN. Cable News Network, 31 Oct. 2016. Web. 30 May 2017. Global Research. N.p., n.d. Web. 29 May 2017. Townes, Carimah. “‘It’s Just Dressed up Slavery’: America’s Shadow Workforce Rises up against Prison Labor.” ThinkProgress. ThinkProgress, 09 Sept. 2016. Web. 30 May 2017. “Primary Documents in American History.” 13th Amendment to the U.S. Constitution: Primary Documents of American History (Virtual Programs & Services, Library of Congress). N.p., n.d. Web. 30 May 2017. No More Slavery by Mireya is licensed under a Creative Commons Attribution-ShareAlike 4.0 International License.